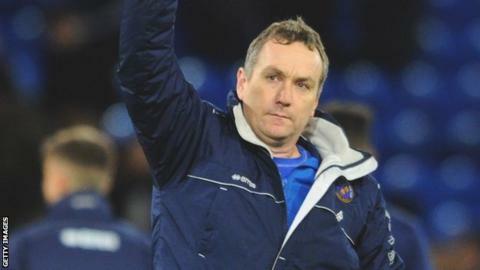 Shrewsbury Town manager Micky Mellon says their FA Cup win over Championship side Cardiff City was their way of paying fans back for a recent 7-1 league defeat by Chesterfield. The League One club beat Cardiff 1-0 to clinch a place in the fourth round of the competition for the first time since 2003. "We had to show some form of reaction," Mellon told BBC Radio Shropshire. "It's been tough, but we hope that goes some way to apologise." Town went into the third-round tie eight days after their worst loss in over half a century against the Spireites - a result that left captain Liam Lawrence "disgusted, embarrassed and upset." But Andy Mangan, who re-signed for the club from Tranmere Rovers just three days before, grabbed the winner to upset the Bluebirds, who are 35 places above them in the Football League. "We let an awful lot of people down (against Chesterfield) and it hurt," Mellon said. "To show that amount of grit, determination and character is how I want us to represent this club." The transfer window has been a busy time already at Greenhous Meadow with four players - strikers Kyle Vassell and Mangan, veteran midfielder Richie Wellens and defender Jack Grimmer - arriving and four, including Lawrence, leaving. Despite being only one point clear of the relegation zone in League One, Mellon insisted the situation is far from chaotic. "Maybe a few have thought we've gone mental in this window and brought people in gung-ho," Mellon said. "We had a plan and Mangan was certainly what we needed, we need that pace. "We needed that power of Grimmer and the creativity we're going to get from Wellens and Vassell - we know what we need to be a force against anybody."